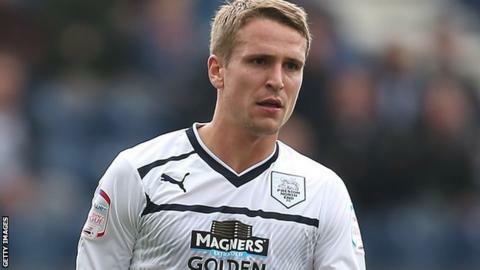 Nicky Wroe's first-half hat-trick helped Preston defeat Scunthorpe. Wroe struck home from inside the box after just 25 seconds before sweeping in Jack King's cross for his second. The midfielder completed his haul when his effort from the edge of the area was deflected in, but Iron striker Leon Clarke bundled the ball home to reduce the arrears. Karl Hawley's spectacular 25-yard effort gave the hosts hope of a dramatic comeback, but Preston held on. "I'm disgusted with the first three goals and then we actually scored two. But you're never going to win if you concede three. "We had some chances, the keeper made some good saves but you're never going to win if you concede three in the first half and we did. "We're doing OK, we went 1-0 down tonight just straight after kick-off. It's just lapses in concentration. There's nothing tactical about it, it's just lapses in concentration and too easy for the opposition to score." "I think the lads took a lot of unfair criticism at the weekend [losing to Sheffield United]. "Tonight they showed the qualities they've begun to show as a team. "The first 40 minutes were a joy to watch because it was almost perfect away-day football. They put Scunthorpe to the sword and really put on a show. "I thought we controlled the game in the second half, and although Steve Simonsen was called into action with a late save, we never really looked like giving up the advantage."